A stressful time for people of all ages. Don't worry; we've got you covered. A fairly uneventful month in RuneScape with only one major content update. 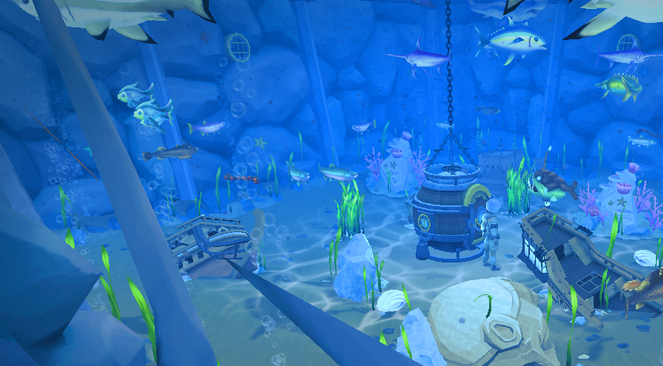 A new room has been added to the player-owned house for the first time in years - the aquarium! This room requires 63 construction and 200,000 coins to create. Here, players can create a submerged room on the basement level of their house to store fish they have caught while training fishing. The fish that can be stored here go from sturgeon to lava eels to great white sharks. Fish are found in the form of golden fish eggs. These eggs are then added to the aquarium, where they will begin swimming around. You can also add decorations to the aquarium, such as White Wolf Mountain or something as simple as seaweed. There are several advantages to creating an aquarium. You can access baitless fishing techniques or cosmetics such as a shark pet, which looks literally like a fish out of water. Big drama came this month in Old School RuneScape when one of the content developers, Mod Reach, was fired from the Old School team. Mod Reach planned to program something in the next game update that would allow him to make serious profits. The details beyond that are not known. Whether or not Mod Reach was involved in bugs like the corporeal beast invincibility glitch is unknown but unlikely. The Darklight upgrade which came with Dimension of Disaster was nerfed this month. Concern rose among Jagex on how much wealth was being brought into the game, particularly with Kalgerion Demons. Jagex then decided to nerf it to below Dimension of Disaster levels. This caused a fair amount of upset, which led to a slight rebuff. Still, Darklight is nowhere near as powerful as it was and is not a must-have weapon anymore. Another controversy this month was a new legendary pet from Treasure Hunter called the drake. Despite its name, the drake is not a hip hop star or a male duck; it is a dragon-like pet that grows to the size of an adult dragon. There have been complaints that it makes the pet dragon worthless, as the it does not require any summoning level or dragon killing. The drake also has several other uses including beast of burden capabilities, some alchemy abilities, and more. Jagex has stated that there will be no change to it. If you frequently play Old School RuneScape, sign up for the Old School Highscores set up by Jure 7he Kin! It's the end of the school year, meaning it's time for a nice promenade. That mainly North American rite of passage for high schoolers which may seem to be a bit overrated. At the same time prom can be a memorable experience if you play it right. We'll give you some advice on how to get you through this ordeal. Prom may not be for everyone. Many find the prom to be mindless consumption and a waste of time. If you have these feelings then I'm not going to bother convincing you otherwise. Prom night is considered by many to be a sign of entrance into adulthood, and if you decide to use that night to defy the status quo then all to you. If your school has a Junior and Senior prom and you don't have much money to spend, I would suggest going to the senior prom only. The junior prom tends to be a less fun version of the senior prom and unnecessary. It's better to go to the senior prom instead of junior prom because it is one of the last times you'll be with your high school class. So, if necessary, save money your junior and senior years and only spend it on the senior prom. Here at Sal's Realm we are experts in providing advice to fellow RuneScape warriors. In some fields. Asking women out isn't one of them. We won't go into the basics, but since asking the girl out to the prom is a big deal we can discuss that. Whom you should choose? If you're dating someone, this is easy to figure out. If not, then this is a big decision. Many people end up going with a close friend. This takes some pressure off the event. A few bold people decide to ask out a girl they have their eye on but don't know very well. This is very risky. First, she could obviously say no. Second, she may not be as fun as you have thought. The last thing you want is a date who doesn't want to be at the prom. Choose wisely. Hooray, you're done! Actually you're not. A more recent trend with "promposals" is to ask her out in a fancy way. Marching bands, stuffed animals, and hot air balloons are all things I have seen when it comes to asking a girl out to the prom. Don't be afraid to do these things, but this puts some pressure on the date to say yes. Keep that in mind. Also, ask early! If you happen to be a girl reading this, don't be afraid to take the initiative. A common complaint I heard from girls around prom time was "I wish someone else asked me." Make sure you are with someone you like. Also, don't spread word around school saying, "I wish Guy X would ask me out." Just ask the person out. After finding a date you should find a group to go with. Going with a group with friends makes the situation that much easier. This isn't always easy though as a variety of friends have a variety of dates who want to be in different groups. Try to be understanding and easygoing with this process. With your group you'll also need to decide how to get to the event. Most groups pick limos or party buses instead of their own cars. I would personally suggest party buses; they are comfortable, easy to move around in, and frequently cheaper than limos. You'll also need a tuxedo. Get your tuxedo fitted and reserved early. Tuxedos are usually reserved quickly on the big prom nights so act quick. You might end up spending a lot of unnecessary money and time finding a tuxedo if you are late to the scene. Some people like to be adventuresome with their tuxedo choices. If you want a tuxedo like this, go for it. You're only young once! You'll also need a corsage for your date. These generally match the dress. If your date is ambiguous or secretive about the color of the dress, go with white. White goes with almost anything. On the day of the prom, pick up the corsage from the flower shop. Make sure you pick it up, not your mother. I was one of those guys who sent their mother (and even my brother) and I should have done it myself. Before the event, do the normal shower, shave, and any other hygienic activities you deem fit. You should be ready to go. Usually before the prom you'll gather at someone's house with your family, eat a few snacks, and take about 10,000 pictures. At first you're going to get your picture taken with your date. Here, don't hover your hands around your date. You have to touch her, whether you like it or not. Next, you'll end up taking the group photos. This is by far the worst part of the prom. You're going to stand in front of a bunch of middle-aged women with cameras yelling "FACE ME!!!" This whole ordeal can take 15 minutes of standing still. Whatever you do, keep smiling and do not lose your happy facial expression. Towards the end of the one of my group photo shoots I got a bit annoyed. When the pictures came in about a third showed me with a subtly pissed face. Don't be like me. There's an old saying out there "to be early is to be on time!" With the prom, this isn't necessarily the case. My group and I arrived at the prom early and the place was fairly dead. Even when the prom does start, it takes some time for people to start dancing. Nobody wants to be the first idiot on the dance floor and everybody stands around awkwardly. Showing up 30 minutes after the prom starts is not a horrible idea. When the dancing does start, get on the dance floor and stay out there. I've noticed a lot of people try to be the guy too cool to get on the dance floor. This isn't a good idea. The prom is all about dancing and you're going to sit there? Have fun. You should also stick with your date. She may be a dud but you're her date for the dance. If you never want to see her again after the dance then all to you. It is common to dance with someone else from time to time as with any dance. Most schools organize post-prom parties that last through the wee hours of the morning. If your school has one of these, go to it. If not, I'd suggest you leave alcohol, drugs, and anything else out of yours. I don't intend to be a moral compass, but 10 years from now pictures of you getting wasted on prom night could prevent you from getting a job. Don't be stupid. Now, you're done. Drop off your date and anyone else if necessary and go home. Congratulations, you've just completed prom night! Rewards: Memories. Grab your 2-liter Mountain Dews! If you're in college, it's probably time for finals. If your finals are imminent and you're reading this, you're probably not good at studying for finals. We'll give you a few tips. Break up your studying. Don't cram for exams one subject at a time. It's best to spread out the practice as this increases memory retrieval. A common thought is to find one place you like studying and stick to it. Seems like a good idea, but it's not the best. Try studying in several different quiet areas for the best performance. It's better to eat lean than eat junk food. Double check the time and place of the exam! I once had a school smart roommate who missed half of his exam for not knowing this. Don't be like this guy; you can be better! As for all-nighters, here's a few things. Avoid them if possible. All-nighters usually involve lack of sleep, which comes with a myriad of problems such as concentration issues, a decrease in long-term memory, and a weakened immune system. Getting severely sick during finals week is one of the worst things that could happen to you. If you see an all-nighter coming, try to take a short nap in the afternoon. Caffeine can help if you are not a big caffeine drinker. If you are then it will have limited effects. Try to keep yourself awake. Occasional walking around can help keep you up. Also, being mildly uncomfortable (low temperature, pinching) will ensure you do not fall asleep on the books. A common mistake people make is sleeping after an all-nighter to make sure you are readily awake for the exam. The problem with this is that when you sleep you lose a significant amount of the information you have stored prior to your sleep. If possible, try to take the all-nighter and then stay awake until you can take the exam. So what are you doing? Get off Sal's and hit the books! A big, popular idea that is floating around right now is to fill the Lumbridge Crater created during the Saradomin vs. Zamorak World Event. It looks like Jagex may even implement this idea - it was on the Runelabs poll and proved to be among the popular choices. Consider this a desperate, last-ditch effort. I figure we have two types of people out there - those whose interests lie totally outside of the game's story and those who are very interested in the RuneScape story. I will make two arguments, one for each of these groups. First off, those purely interested in gameplay and no interest in story. The main continent is already getting packed in. There are minigame entrances everywhere, banks, etc. Do we really want to lose more land? Check out the world map - the Lumbridge Crater is huge. If we fill it in with water, ~90% of it will be unable to be walked on. And it's not as if Lumbridge needs another body of water. There is already the River Lum to the east of Lumbridge Castle and that is enough. I know what you're thinking: "But they're going to add skilling nodes on the Lumbridge Lake, the area won't be useless!" I am aware of this but still not sold. First, you're assuming that the skilling nodes will be useful. Remember the Nexus? You're also assuming that skilling nodes will be placed there in the first place. In their short description of the project, Jagex stated nothing about skilling nodes, only a filled crater. We could end up with nothing more than a big lake. Aside from this, we don't need a lake to add skilling nodes into the Lumbridge Crater. Now onto the people who are into the RuneScape storyline. As you know, the god Guthix represented balance. He also took on the form of nature. His color is green, his resting place is filled with vegetation, he was frequently seen in the form of a butterfly, etc. Guthix's link to nature is obvious. Guthix was also in some sorts an anti-god. He believed gods should not live on the planet and cannot coexist peacefully with mortals - this is why he allows himself to be killed. Needless to say, Guthix's idea of a peaceful world is not working out with the second God Wars. The Lumbridge Crater is the best representation of this new trend. So, what do we do with the Lumbridge Crater? Let nature take over it. Grow back the forest that was there in the first place. It will show that despite the acts of the Gods, mortal life and Guthix's ideas continue to persevere. In short, filling the Lumbridge Crater with water would hurt gameplay and is symbolically not the best solution. Q: Why did you do so poorly on your finals? Q: You were absent to your finals? A: No, but the kid next to me was!